I have discovered another artist whose work I really love -- Marion Boddy-Evans. Marion lives and paints on the Isle of Skye. (How cool is that?). According to her website self-description, her primary medium is acrylics. Most of her current works are on the themes of seascapes & landscapes, sheep, and trees & forests. For example this painting below is titled "Minch 12." 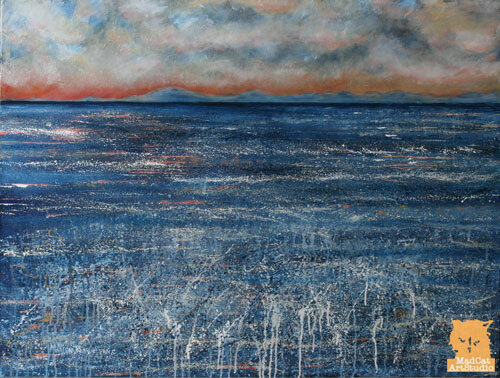 It is in her Landscapes & Seascapes series, inspired by the view of the sea as seen from her studio. As can be seen in this painting, she has an amazing command of colour, and handles the paint expressively to convey the mood of a place. Her tree and sheep paintings are equally wonderful. In addition to her website, she also has a blog, the Mad Cat Art Studio, and she has published a book, "The Moods of the Minch." But wait, there's more! She also is a writer and a teacher. For more than ten years, she has written the Painting pages on About.com. The site is extensive, and includes articles on each painting medium (oil, watercolour, etc. ), various painting styles (abstract, realism, etc. ), colour theory, composition, begin-to-paint introductory lessons, and much more. I especially like her projects and tutorials section. In this section, she presents a series of tutorials on, for example, landscape painting, or portraiture. Her explanations are explicit and well-written, and include visual examples. She welcomes comments from her readers as well. She also sets monthly painting projects, in which she presents a specific challenge, and invites readers to submit their work. For example, the February/March 2013 project is "Opaque-Colours Portraits." Marion has quite a following. Often 20-50 works are submitted in response to the monthly challenge, and Marion somehow finds the time to write helpful and encouraging feedback about the paintings to most of the participants. I guess I am one of the only people on the Internet who didn't know about Marion Boddy-Evans! I am glad I finally discovered her. 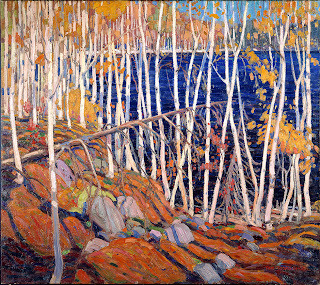 I have always been a great fan of the paintings of Canada's Tom Thomson and the Group of Seven. 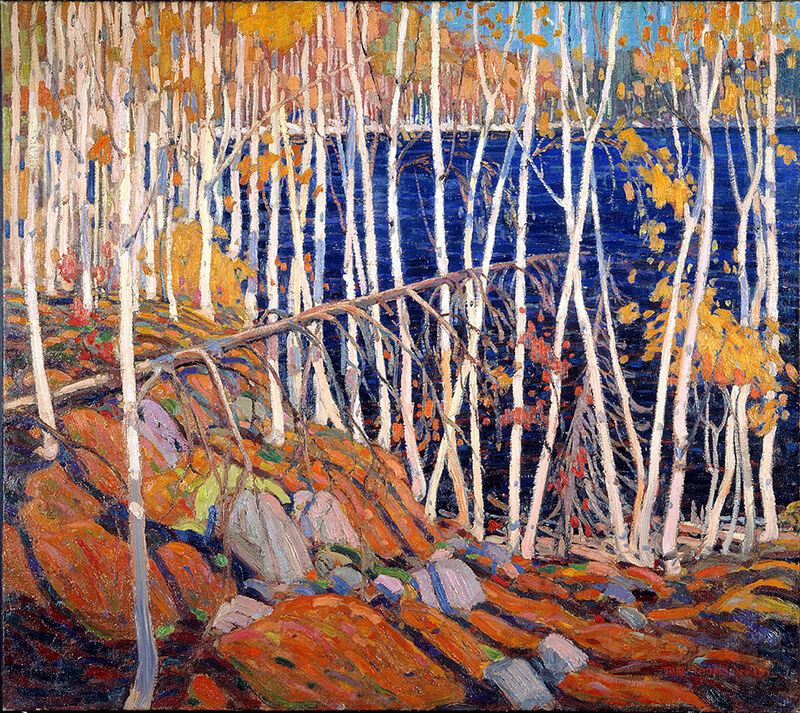 This painting, In the Northland, is by Tom Thomson. 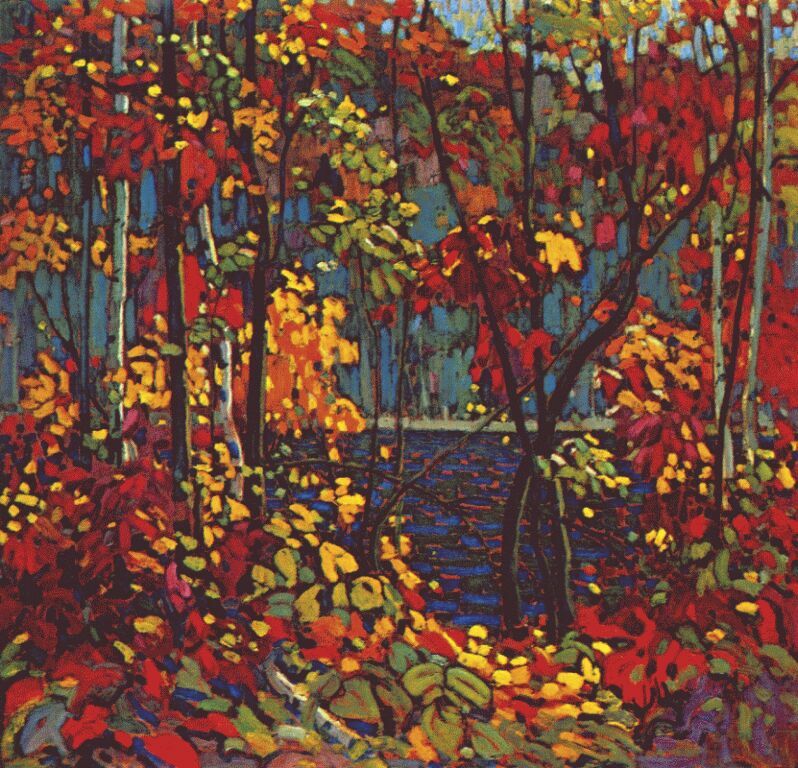 Tom Thomson hiked and canoed through northern Ontario, painting landscapes along the shores of the Great Lakes and especially in Algonquin Park. The painting below, Northern River, was painted in 1915, nearly a century ago. The painting below, The Pool, also was painted by Thomson in 1915. The three paintings that I have chosen to feature here show interesting differences in his treatment of trees. In each composition, the viewer is looking through trees to a body of water. Each painting demonstrates sophisticated and dramatic use of colour to represent the quality of the light. As well, each painting makes use of verticals contrasted with larger masses or colour blocks. And yet, each painting is quite different in mood and technique. I can look at Thomson's paintings again and again, and I continue to marvel at them and learn from them. 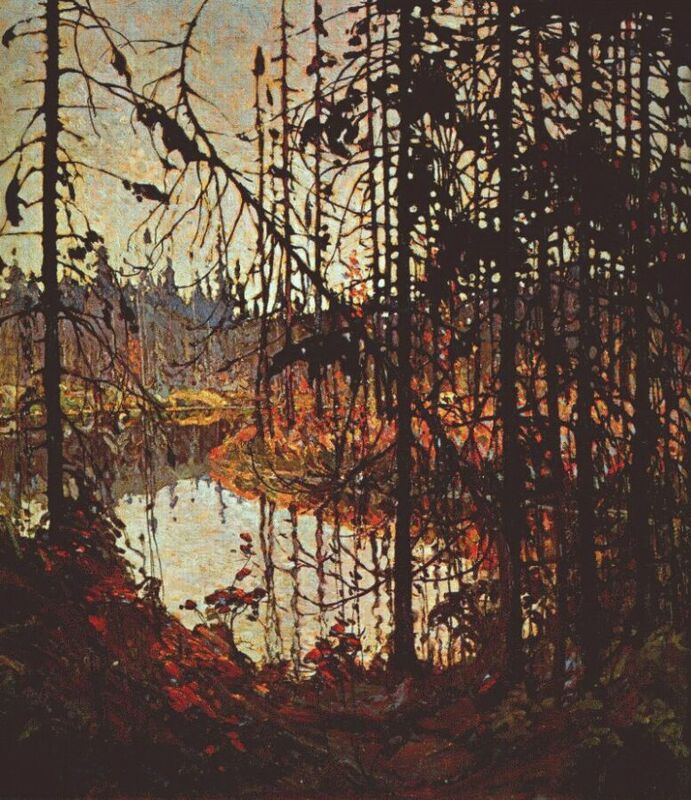 There is a brief biography of Tom Thomson written by Brandi Leigh here.